Do you love fall colors? I do. As much as I don't like the idea of winter coming, fall is beautiful here in western Pennsylvania! We have a yard full of trees and shrubs and I can't help picking up certain spectacular leaves as I walk past. 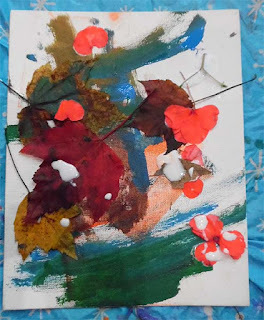 This year, I decided to do some art with them, with my 3 year old granddaughter who loves to create. We picked up several we liked -- be sure to let them choose their own, and picked a few coral impatient petals to add variety. Then we painted our cheap 8x10 canvases with blue and green and red and orange, let it dry, and simply used Elmer's glue to attach the leaves and petals. Attach them whole or tear them into smaller sections. And this is mine. It's not done yet. I want to play with it and experiment more, but there's only limited time when you're working alongside a toddler. If you don't want to use canvas, you can use heavy art paper instead. We used acrylic craft paint, but tempera would work, or even watercolor. The watercolor might smear with the glue, but that could add to the piece. Do be sure to protect your surface area. We use a big plastic tablecloth on the floor to allow room to move without painting my carpet. If you make your own, I'd love to see photos of them in the comments. Anyone who has taken care of a toddler knows they tend to eat like mice, not much at a time, but constantly foraging. 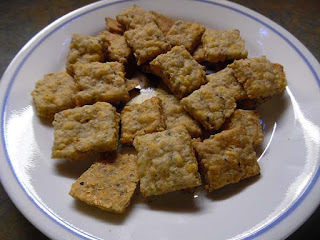 I've become somewhat of a health nut in the past few years, so while, when my own little ones needed a quick snack, I opened a box of crackers, still trying to stay on the healthier side of things, and thought I was doing well, I now search for better options as I can. With GMOs and all kinds of preservatives and such, whether that's new or I wasn't aware enough before, I even hesitate to give the grandbabies store-bought "healthier" crackers. Pulse 1st 3 ingredients in food processor, add butter and pulse until ball forms, adding water if needed. Roll out onto floured surface, cut thin, and bake at 400 for 13-15 minutes until golden brown. I pulsed everything but the butter just enough to mix them together, and I didn't bother to let the butter soften first. That might be why I had to add about 3 tbs of water before it would ... well, it didn't form a ball (the first time, either), but it did get moist enough that when I dumped it out on the flour-coated counter, I could easily press it into a ball and then roll it out. I apparently rolled it thicker than they intended, also, since they took 15-20 minutes to be cracker-crisp (at 400 degrees). I did pull out the thinner edge pieces when they were done and then stick the rest back in. So if you're more careful than I was with your rolling, you could leave them all in for the same amount of time. If you want more pieces and faster baking, roll them as thin as you can while still being able to pick them up and transfer them to the baking sheet. They turned out very well and I'll use my own recipe from now on. You could use any shredded cheese. I used what I usually have, and I like it better than cheddar. All whole wheat flour is fine, too, and better if you don't mind the harshness. Oh! I actually did two batches while I was making a mess (um, baking - kind of the same thing for me) anyway, and in the second batch I added some Parmesan cheese, which then needed a touch more water. Both are pretty good - enough even the adults in the house were grabbing them, myself included. I have them stored in a closed container. They'll last as long as you need them to last, I imagine, which around here, won't be long. If you make a bunch, you could always freeze part of them to keep them fresh. If you make them, I'd love to hear your thoughts, especially if you make your own adaptations. 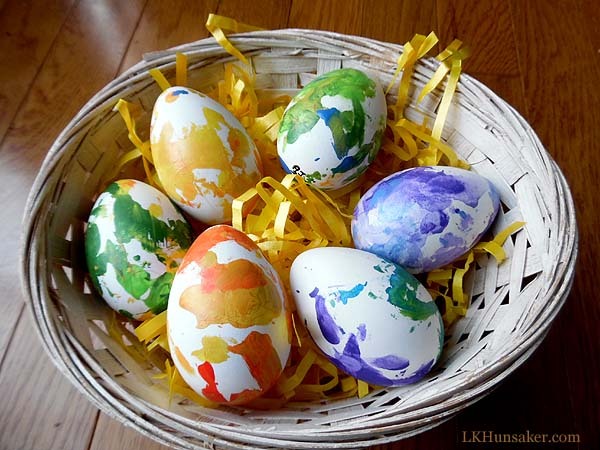 Coloring eggs for Easter has always been a tradition for us, as for many families. I don't know about you, but I always think it's sad that those beautiful eggs don't last. So when I found fake eggs that didn't open to put goodies inside, but to dye into permanent colors, of course I grabbed them. Well ... they don't dye very well. But they do take paint very well! I keep thinking I'll paint some delicately and prettily and use them ... for decoration, I guess, but I haven't done that yet. 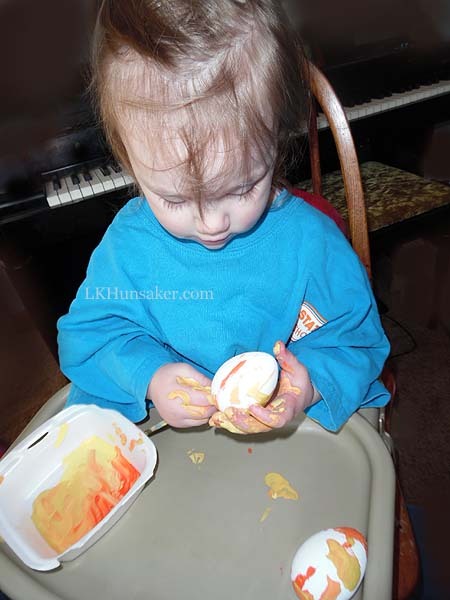 This year, I had a moment of inspiration when my granddaughter wanted to paint and reached for a white egg. Of course! Perfect! Colored eggs that will last through the years, with the additional benefit of saving those precious childhood memories! You could use tempera or watercolor so they're more easily washable, but I suggest craft acrylics, which are super inexpensive. Just be sure to wrap little one in a smock or paint shirt and protect surrounding surfaces. Once it's dry, it's there. And they dry fast. I started by giving her the white eggs and dabbing a couple of colors of paint into a disposable container (only a few drops will work). 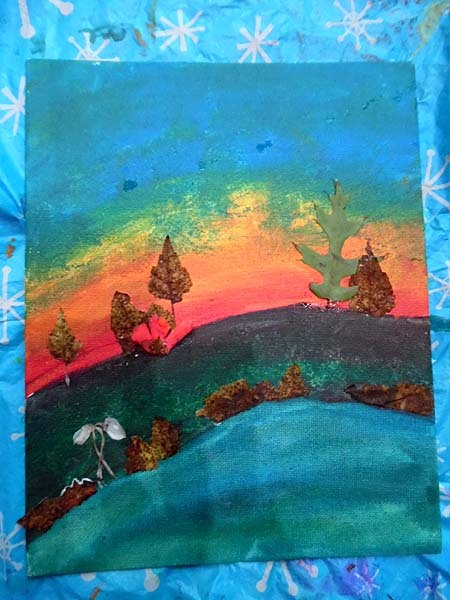 She started with a brush and then decided finger-painting was more fun. She did two each of three color mixes, to give me half a dozen pretty little keepsake art eggs, as seen above. Yes, that is completely her work. And then I had to experiment and paint a base coat on another six eggs before I handed them over to my little artist. You may need 2-3 coats to get a non-streaky base coat depending on your paint. A tip: toilet paper rolls work great to hold them while one half dries before turning them to paint the other half. After they were fully dry, I took them outside and propped them up in a non-windy spot and sprayed them with acrylic sealant. You can use matte or glossy, whichever you prefer. I used semi-gloss. The white eggs absorbed it without taking the shine, although the paint has a sheen to it, but the fully painted eggs have a nice shine without being glossy. I sent a dozen, 6 white and 6 painted, to my grandson, also, and I look forward to see what he comes up with. :-) I sent them too late to have them back for this post, but I may have to update. I put baby girl's initials and the year on the bottom with an ultra fine Sharpie so I can tell them apart in later years. I may make this a yearly tradition, as well. Yes, we'll still color the real eggs, too. I won't mind as much not being able to keep all of those pretty eggs now that I have keepsake sets. 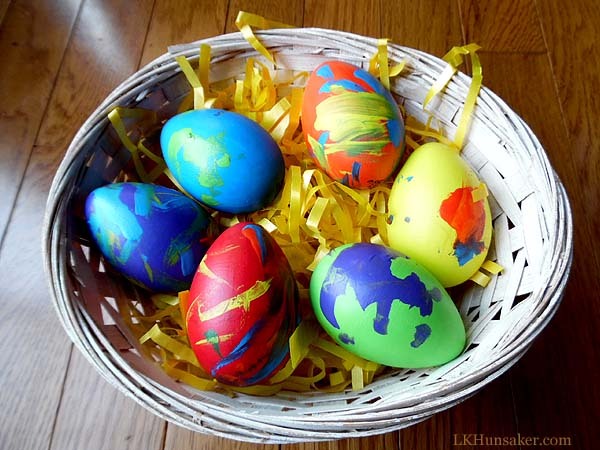 Do you have any Easter or spring crafts for little ones to share? I'm always looking for guest posts. Gail Trunick - CLAY & RUST from Kevin DeOliveira on Vimeo. Connie Andrews creates beautiful oil and pastel paintings in her home studio in Central Illinois. I met Connie through my sister and have worked with her on the cover of a still-to-come therapy book. Along with being an incredible indie artist, she’s a lovely person. I’m honored to have her here at Elucidations. LK: Hi Connie, let’s start with something fun. What is your favorite color and what is it that draws you, so to speak? CA: My favorite color changes from time to time. I would have said dusty pink a few months ago. Why? It is a rich color, not too bright and garish yet not too child like pink either. It feels fancier to me somehow. But right now, I believe my favorite color would be a deep maroonish cherry red. It is still in the same color family as the dusty pink, just much deeper. I am also creating a wax sculpture now and the wax I am using is about the color I described. LK: I always find it interesting how favorite colors change with age and life events. Speaking of changes, I have to ask, since you transitioned from auto upholstery to reporting to becoming a full time artist, how did you decide to take that leap away from a traditional paycheck to working for yourself? CA: Let’s see, I owned my auto upholstery business and my reporter job was freelance, so actually I have been pretty much self employed all along. I have had some side jobs along the way to supplement my income as an artist, though. One day, while cleaning and organizing another self employed friend’s house, I had a revelation. I realized that I was helping her further her career by doing her mundane, time consuming tasks that almost anyone could do. While I was making a little money, I was not doing anything to help my career thrive. I decided right then and there that I needed to do something different with my time to make ends meet. LK: What are the benefits and drawbacks of being a self-employed artist? Are you finding it worthwhile? CA: The benefits to being a self employed artist are many. I am, for the most part, able to make my own schedule. If my muse decides to keep me up until 4am painting, then I am able to do that without having to worry about going through a 9-5 workday. Most of the time, I am available for my daughter. I am able to attend most of her school functions and be with her on her summer vacation, winter and spring breaks, days off of school and after school. I get quite a few commissions and for the most part, people hire me to create a piece of art for someone as a gift. I love meeting new people and being able to be part of their special occasions, in a background sort of way. Another huge benefit is that I am doing what I love, what I feel I was born to do. Paint, create, make feelings and ideas into 2 or 3 dimensional pieces of art that others can see or touch. There are some drawbacks though. Lack of money can be one of them. Many people think that artists, being the caring people that they are, should give their work away at auctions or volunteer their skills to help others. I feel like my skills are something I have worked hard at perfecting for many years. I know many mechanics, carpenters, and other professionals who are very skilled and wouldn't dream of asking them to perform their services for free. Why do people ask professional artists on a regular basis to "donate" their work or time? The economy has also hit many artists. Art is, to many, a luxury, and therefore, sales are usually minimal when times are tough. One of the other drawbacks is that when doing commission pieces, which so far is what has kept me going, I am trying to bring someone else’s ideas into being which sometimes can be difficult. It is definitely a challenge to keep a balance between pleasing the customer and pleasing my own muse. LK: I’m glad you mentioned the free expectations with art, since that’s also a big issue with writers. My thought is the same as yours. Artists work as hard as anyone at their craft. Why give it away free? I think it devalues what we do when we agree to that, but it can be tough to compete when so many do. What reactions do you tend to get when someone asks what you do? CA: Most people are pretty curious when they hear that I am a full time visual artist. When my only studio was based in my home, I would get the reaction that conveyed they didn’t think I was a professional. Being a resident artist at a studio outside my home seems to validate my reputation as a serious artist. There are so many people who say, “Wow, I can’t even draw a straight line without a ruler” to which I usually think “me neither.” I will probably always use rulers. LK: I think I’d like to see the reaction when you say you can’t! It’s funny, and a little sad, that working at home gives that connotation, isn’t it? Recently, you were called upon to to do courtroom sketches. Can you tell us about that? CA: An artist friend contacted me because she had heard that a TV station out of Springfield was looking for someone to be a sketch artist for the Christopher Harris trial. He was accused of killing 5 people in Beason, Illinois. It was a gruesome trial, but probably one of the most interesting jobs I have done yet. I absolutely loved the challenge of trying to capture the moment in the courtroom. I was there for the whole opening day with my pastels and paper. The day went by super fast. I was told by many people that they were surprised that the people I drew actually looked like the people in the courtroom. I thought that the whole idea was to capture a likeness and show what the scene inside the courtroom looked like. . I guess the reason it was such an exciting job was because it felt like there was a story unfolding before my eyes, and I was able to do one of the things I love to do the most in this world, draw and paint. I hope that I get hired to do more courtroom sketching. I can picture myself doing that on a regular basis. LK: The painting on your website home page, My Father’s Hands, is so touching and evokes love and respect as well as telling a story. In fact, I love every piece in your Hands series. How did that come about? CA: Thank you. This is one of my favorite pieces. It holds a spot very dear in my heart. “My Father’s Hands” is the painting that started my hand series. My father, who retired from the Marines after 24 years, had very strong hands that had been through two wars. Yet he was able to use those same hands to do the delicate work required for these tiny dollhouse furniture pieces. I took pictures of him working with these pieces one summer in early June. I am glad I didn’t put off taking the photos. We had no idea that in about a years time he would be gone. I finished this piece just in time. I was able to show him the finished painting the day he died. LK: Now I love it even more. That’s just wonderful. And I could go on and on about the military and gentle hands, but I won’t do there here. So, what are your favorite activities outside art? CA: I absolutely love to sing. I was hired last year as the song leader at Union Church in Brimfield. They asked me to direct the choir at Christmas and I discovered that I love doing that as well. LK: Very nice! I see you’ve done other book covers as well. Is that something you’d like to do more? CA: Yes, I would like to do more book covers. I enjoy working with the writers/publishers to design a cover that will help to sell the book. It is also very satisfying to see my artwork in print. LK: (Hoping my indie writer friends will give that a thought!) To bring more of the arts into this, do you listen to music as you paint? If so, what genre(s)? CA: When I am by myself or won’t disturb anyone, I listen to music that I can sing to: Carrie Underwood, Daughtry, Bon Jovi, Faith Hill, Evanescence, Ray LaMontagne. If I am at my public studio, then I usually listen to music without words, like new age, instrumental or classical, so the temptation to sing at the top of my lungs is removed. LK: I promised this would be short, so I’ll leave off with one last question. Are there other indie artists in any field you’d like to recommend? CA: I have so many artist friends that I don’t want to leave any out. The building I have my studio in, Studios on Sheridan [in Peoria IL], has 12-15 artists. There is one woman by the name of Jill Goforth, that you, as a publisher, might be interested in since she creates art from books, using the pages and sometimes the spine to form things other than books. There is also a women by the name of Jessica Ball, that has a business that seems to be the new trend. It’s called the Art Garage. People can show up for an hour or two and for a minimal fee, create a work of art or craft item with her supplies and guidance. My studio partner, Gloris Young, has been searching for her visual voice for awhile and has possibly found it now in what she calls Pop Art Pets, funky, wildly colored, yet with realistically portrayed eyes. There is Rebecca Draland-Doyle who is a very dear old friend of mine. Rebecca is a very dedicated artist who paints beautiful abstract pieces. The list goes on and on, Billie Howd, Myra Branch, Steve Boyd, all accomplished visual artists. If you are interested in musicians, Winston Dunbar writes music and plays in a few bands in the area. He has written some wonderful pieces that deserve more recognition. LK: Connie, thanks so much for your time. I know you have a website at ConnieAndrews.com. Are there other links you’d like to leave? LK: My pleasure! Thanks again for talking with us! I found Beth Akerman’s photos on a friend’s Google+ page, and I promptly added her to one of my circles so I could keep up with her work. Beth, a trained artist, grabbed onto my love of nature with her vivid, artistic photography. As an amateur photo buff, I know it’s not easy to get nature to cooperate with the mechanics of a camera; you have to have the right angle, the right lighting, and the right settings to capture a purely beautiful scene. It’s not as easy as some photographers make it look. Beth is one of those. LK: Beth, welcome to Elucidations and thank you for being here to chat with us and show off a bit of your work. Will you share a bit of your background and tell us how you were pulled into photography and design? BA: I have a BFA from Wittenberg University in Springfield, Ohio where I concentrated in printmaking and art history. Some of my design work comes directly out of my printmaking background, specifically my ink designs. I learned to look at and for little details and think outside the box while in college, and it has translated into the way in which I work both in ink, painting and photography. I have never taken a photography course, and am totally self-taught in photography. Mostly through trial and error, but the concepts of design, composition and color where well grounded already from my art background. LK: I have looked through a lot of your photos and I’ve noticed you have a penchant for close up nature work. What draws you to that focus rather than to landscapes or hard surfaces or people? BA: I like details and finding things within things, like the shape of a twisted dry grapevine, or the texture of the petals and interior of a flower, the fuzz of a bee, and so on. I see potential in the small things that others might overlook. I do like landscapes and would love to do more of them, but I live in a suburban area that does not allow for too many of those. I also really do not have a huge interest in photographing people, but from time to time to stretch my wings I will photograph them. I did several portraits of my boyfriend dressed up and pretending to be Pablo Picasso for an Artistic Photography Mentorship I have on Google Plus for a Picasso assignment. They were well received. I may try a few more in the future. LK: You have also taken part in charity work, through two photo books and with art raffles for sea turtles and tsunami relief. What brought you to engage in helping with your chosen charities? BA: The Leaf Portraits book came about last year as several people told me that I should make a book of them. Since I really didn’t need the income from the book, I decided to donate the proceeds to a local school that I am a member of the Alumni Parents Association Committee. It was a collaborative effort with the leaf photography and poetry of several friends from Fine Art America, Google Plus and one dear longtime friend and supporter, Amos White whom I have known since college. 100% of the proceeds was donated directly to the school. The Google Plus Female Photography Book called How We See It...our view of our world again was a collaborative project for charity. 33 female photographers from Google Plus contributed images to the book, and over $250 (at $4 and $5 per book profit) was donated to the NOW Love Your Body Foundation that deals with body images issues and eating disorders. A cause close to my heart and that of many of the 32 other contributors to the book. A second book that is expanded to include many more Google Plus Female Photographers and female writers is in the works. It will be released on Blurb at the end of October, and will be called How We See It...more views of our worlds. The sea turtle project over 2 years ago was in response to the Gulf BP Oil Disaster. I have always loved sea turtles, and enlisted my Facebook friends at that time to help raise money to sea turtle rescue. Many of my high school, college, and sorority sisters purchased sea turtle jewelry and artwork with the proceeds being sent to various sea turtle rescue societies. The I Love Japan fundraiser primarily through the proceeds from the sale of various artworks of both myself and my then 13 year old son was the result of wanting to help with Japanese Tsunami Relief. My son loves Japan and the fundraiser was mainly his idea. Money was donated to the Red Cross for Tsunami relief. LK: I was especially drawn to your photo book compilations with other photographers and poets. Leaf Portraits grabbed me due to my love of trees. Can you tell us more about the Wellington School art program it helps to support? BA: The Wellington School is a private independent pre-K through 12th grade school located in Upper Arlington, Ohio. My now grown daughter is a graduate of the school, and I have been involved in some manner with the school for over 18 years. They have a wonderful and strong arts program, both in the visual and the performing arts. Like any other private school, the school must raise money for its programs through its parents, alumni parents, alumni and other fundraising events, including the yearly Arts Premiere. I was honored to have been able to participate in the 2012 Wellington Arts Premiere by offering 3 of my photographs and several macro photography experiences for young photographers at the school. LK: Your newest compilation is full of work by female photographers. How We See It... Our View of Our Worlds has a great cover and I assume they are the book contributors. What led you to the thought of doing a women only photo book? BA: Frequently what I have found is that the art and the photography world is pretty male dominated. What I found in joining the Google Plus social network while it was still in Beta was not only was there a great and supportive art and photography community there, but a strong women’s artist and photography community there. I met many wonderful female artists and photographers there, and felt it would be a good way to help bring some more attention to the high quality photography of the female photographers on Google Plus. It is a great community and not only are the women photographers on Google Plus wonderful and highly supportive of each other, the male photographers as a whole are highly supportive of the female photographers there. Plus, it was kind of a way to show the guys that the girls are pretty darn incredible too. LK: Aptly, the charity How We See It supports is female related, as well. Can you tell us a bit about NOW Love Your Body Foundation and why you chose it? BA: The charity was actually chosen by one of the other participants. However, it is something very close to my heart. I nearly lost my then 15 year old daughter 8 ½ years ago to an eating disorder. As a parent who went through that experience, I believe very strongly in promoting healthy body image and eating disorder assistance and hopefully, trying to find ways to prevent them in the first place, by identifying those in danger of succumbing to them before they get out of hand. A number of the other book participants either have struggled with body image issues and/or eating disorders or know someone who has struggled with one or the other. LK: We share a similar path in that our families took the place of our art for many years. Do you feel that affected your work or your current work ethic? BA: At the end of the day the answer is no. I always drew and created some art during the years I was raising my children but didn’t try and pursue it outside of doing art for myself and my family and friends. I also made jewelry during those years and sold them to co-workers and friends. So I kept creating to a certain extent. Also, I think now that I am more mature my work is more mature and I am able to focus more on the areas that I have consistently been good at over the years, namely the ink designs, and being more choosy on adding new and different things like taking up photography. I always knew that art was something I could easily pick up again. Actually it took a visit to a former next door neighbor’s art gallery that she had for a few years before closing it to concentrate on her family that inspired me to really take up the art again. Kind of a “hey I can do that moment.” I had some early success in that my work had been in art galleries before right after college, and I had received several commissions over the years, so it was kind of picking up to a certain extent where I left off in many ways. However, with the internet and the ability to sell your work not only in the traditional means such as galleries, commissions and art shows, but via print on demand services like Fine Art America and SmugMug, my main art sites for my photography and art , have changed the game a bit and made it easier to get out there again and start building a following for my work. It does still involve a lot of work and a bit of luck, but it does make it worthwhile to get instant feedback when you post a work that is positively received. LK: Just for fun, a few artsy personal questions: What music gets you going? Who is your favorite fine artist? Like any particular dance style? How about a favorite author or reading genre? BA: I love punk rock and alternative music, namely stuff like The Ramones, The Smiths, REM, No Doubt, and Green Day to name a few. My favorite artists have to be Claude Monet, Pierre Auguste Renior, Pablo Picasso, Georgia O’Keeffe and Jackson Pollack. Sorry have more than one of those. I don’t dance at all. My family says that is something I shouldn’t do. I love to read John Grisham type legal novels and John Jakes type historical novels. LK: Beth, thanks again for sharing your time. Before you go, do you have any advice for amateur photographers interested in going professional? BA: Try everything photographically and then find a few niches that work for you. Don’t be afraid to be a bit different, but still be yourself. Don’t get discouraged, and get out and network and promote yourself in a positive manner. Be nice and kind, it will get you further than having an attitude. And don’t allow others to discourage you, walk all over you, and don’t be afraid to stick up for yourself sometimes. Realize not everyone is going to like what you do, but there is always someone out there who does like it. Find your audience. A lot of very nice fonts completely free for your indie art projects. Elucidations.us is created and maintained by Elucidate Publishing. It will feature not only indie books, but also fine arts, music, dance, theater, and any other independent do-it-yourself art we come across. We believe indies are the heart and soul of the arts as they tread their own paths and create what they feel, regardless of current trends. We encourage them in that path. Please, support indies, especially your local indies! Elucidations.us and Elucidate Publishing are owned by author LK Hunsaker. Hunsaker has a BS from UMUC and an AA from ICC, with emphasis in psychology, art, and English. She is published in ezines, anthologies, and print magazines, has founded her own company to suit her needs of individualism and creative control, and often assists other authors with their publishing goals. K. Hawkins is EPs technical director. Hawkins has an AS in computer programming and has done further job training on her own. She is also an avid reader and crafter. Find an Indie Store near you! All content on this site ©Elucidate Publishing. Use of information on this site must be requested.. Awesome Inc. theme. Theme images by Roofoo. Powered by Blogger.